Do you ever think about how there’s a supervolcano underneath Yellowstone National Park that could explode at any second and kill us all? Okay, that’s a little bit of an exaggeration, but there is a massive caldera lying underneath the surface of one of America’s most popular tourist attractions. Researchers don’t know when it’s going to erupt next, but they now have a better idea of how much magma is recharging the mantle. And now, a quick refresher on how calderas work: Regular volcanoes, the kind you see in movies and elementary science projects, are mountain-shaped, with an interior cavern that lava funnels through and shoots out of. Calderas are the opposite. They’re basically giant caves full of magma that cook away until the surface can’t withstand the pressure, and eventually explode. This particular caldera is also a supervolcano, meaning it’s wider than average. 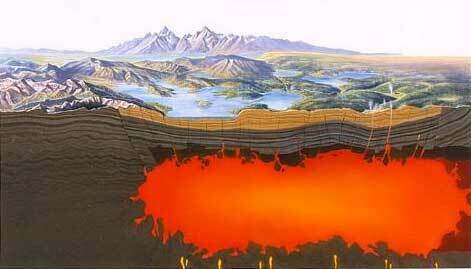 Yellowstone’s caldera is approximately 30 miles long and 45 miles wide. And the last time it exploded, about 640,000 years ago, it spewed 2,000 times more ash than Mount St. Helens did in 1980. But, as most impending doomsday scenarios, there’s a silver lining: It’s very unlikely that the volcano will explode any time soon — about 0.0000014 percent likely. Back to what we do know: A team of WSU and University of Idaho researchers found out that there’s more water going through Yellowstone springs and more heat leaving the springs than we thought. This data will allow for a better approximation of how much basalt magma is recharging the volcano each year — the magma that heats the explosive, silica-rich rhyolite that could break through the Earth’s crust. The team found this out by spiking hot springs in Yellowstone with a stable hydrogen isotope and measuring how long it took for the hydrogen concentration to fade into background levels. They also measured the temperature of the water, which gave them the measurements for how much water and heat was flowing out of the springs. And the tests were both environmentally safe and unnoticeable by visitors. This study doesn’t give us all the answers about the supervolcano, but it does provide a key step to understanding what the future holds for Yellowstone.